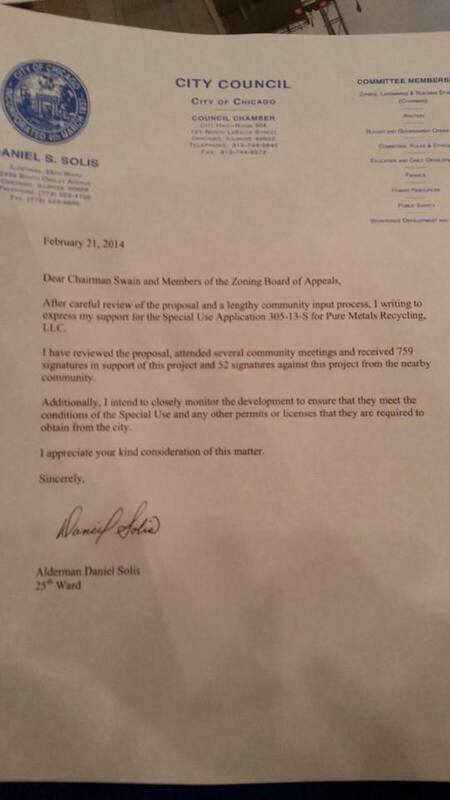 Yesterday, after multiple continuances, the Zoning Board of Appeals (ZBA) heard the arguments for and against the proposed metal shredder in Pilsen. The chairman, Jonathon Swain, stated that this was his longest meeting as chairman. It started at 1pm with a press conference by PERRO and LVEJO. I would guess they brought about 50 people for the press conference. Pretty impressive numbers for 2pm on a Friday. They probably should’ve waited until later to show up. The official meeting began at 2pm. Due to the large audience and long debates, the board put this issue at the end of the meeting. Our issue didn’t come up until 5pm. The lawyers and supporters (the same ones who started this “STRANGE ANGLO” business) for the shredder talked for 2 hours. The lawyers for their competitors, who oppose the competition moving into the neighborhood, talked for an hour. So the neighborhood people didn’t get to make a comment until 8pm or so. I made a comment that was based entirely off of my previous post, but just the science part. I probably should’ve just read straight from it, but instead I worked mostly off-the-cuff. A few people seemed to think my testimony was among the most effective. Belhu Sanabria of LaRaza took my picture. In the end, it’s politics, so it’s probably going to come down to $$$. The alderman, or his political organizations, have taken over $50,000 from the owners of the proposed facility. As I showed in my last post, the last time he took $50,000 from a company it resulted in 420 premature deaths over 10 years; so dozens of extra cancer cases from this facility shouldn’t keep him up at night. The alderman issued a letter of support (pictured below; from Pilsen Alliance’s Facebook) for the facility without even bothering to show up to hear the testimony of his constituents opposing it. No surprise. You can’t just go taking large sums of money and then not deliver the goods. Anyhow, there hasn’t been a decision from the board. That should come out next week. No one expects a decision in our favor. They claim they won’t be using any heat. It’s not clear to me if that lack of heat applies to the metal recycling process overall including the very relevant torch cutting process, or if it just means they won’t be melting anything down. I’m not a lawyer, so I didn’t try to cross-examine anyone. If they aren’t being sneaky with their language, this is a good thing. Their facility will be an order of magnitude larger than any of the ones in the study. The study looked at facilities that process 200-500 tons of metal per day. Their facility was estimated to be processing 3000-4000 tons per day. That’s between 6 and 20 times larger. This is a bad thing. We met again yesterday at the zoning hearing. My name is Maria and I am a PERRO member . I said hello to you and asked who you were with. Sorry I didn’t recognize you from the last hearing . I just wanted to say that what EMMA and friends wrote about you is disgusting. All the lies and slanderous accusations about people and organizations are a joke. It is a bit scary how chummy they have become with the alderman and PURE metals and also the way they behave like street gangbangers. Anyway, I’m glad you testified agiant the company yesterday and one day they will see how they( emma and friends) sold their souls by manipulating students and selling out . Pure Metals will have their day as well. Ja ja … Good point !